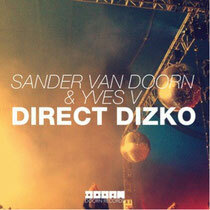 Sander van Doorn is back again with a new collaboration with Yves V entitled ‘Direct Dizko’ out now on his own DOORN Records imprint. The collaboration came about when Sander and Yves V met at Tommorowland and instantly clicked. ‘Direct Dizko’ is one of those tracks that brings back memories, van Doorn says. “It’s an instant classic captured in the sound of today!" This year has been pretty big for Sander . In January 2013, he released ‘Joyenergizer’, a track with a balance between techy tribal intro beats, a progressive melodic break and deep electro house sounds. In March 2013, Sander unleashed ‘TEN’ together with Mark Knight vs Underworld, which entered into the top ten in Beatport’s main chart. Back from Miami playing at Ultra Music Festival, Sander’s release ‘Into The Light’, a collaboration with DubVision, was released in April. Most recently he released ‘Neon’, which was received so well that the PSV Football Club in Holland will be using it as their new anthem. Check it out above. When some one searches for his necessary thing, thus he/she needs to be available that in detail, so that thing is maintained over here. Hi, I do think this is a great blog. I stumbledupon it ;) I am going to revisit yet again since I bookmarked it. Money and freedom is the greatest way to change, may you be rich and continue to guide other people.